This Crown Royal, the first of its kind, is created with a 90% of Rye in the mash recipe and delivers exactly what it promises. A wonderful rye experience. Nose (89): more than average. honey, dried flowers, spices, cloves, pepper, vanilla, peaches. Palate (88): powerful, oily. honey, citrus, spices, cloves, wood, cherries. Finish (88): longer than average. honey, corn, spices. 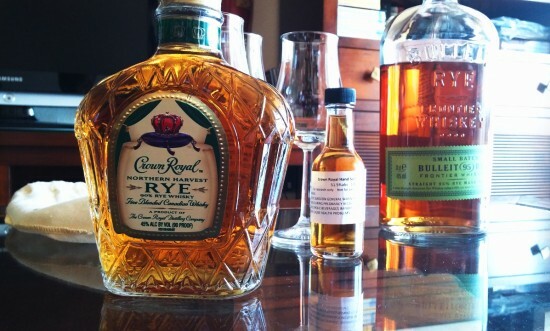 So based on other whiskies I have already tasted I rate this Crown Royal Northern Harvest Rye with 88 points over 100. I really love powerful bourbons and rye whiskies like the one Buffalo Trace creates, and eyes closed this Crown Royal Rye can be perfectly mistaken by one of them. A fantastic experience… and of course, drink it straight. Today’s second whiskey is a higher strength ( but no cask strenght I feel ) single cask whiskey. The idea here is that retailers can order an entire cask, and as you know each cask differs slightly one from the other. So, let’s see how it relates to the original Crown Royal. Nose (91): more than average. honey, corn, wood, spices, cloves, cinnamon, vanilla, citrus, fruits. Palate (91): powerful, oily. honey, corn, spices, cloves, cinnamon, wood, pepper, citrus, liquorice. So based on other whiskies I have already tasted I rate this Crown Royal Hand Selected Barrel with 91 points over 100. A great experience. I really think that it is more because of the extra alcohol than the single cask, that this whiskey is so close to a great bourbon… just add four or five drops of water and you get back the smoothness of Crown Royal whiskeys. A fantastic set of whiskeys. I have been drinking Rye whiskey ( Bulleit Rye in case you are wondering ) lately and this Crown Royal is really good. I have no idea how much they will see it here in Europe ( or what it is left of Europe anyway ) but for $29.99 it is a real bargain.